In the digital world, tags are ubiquitous. When we digitally tag items, we are essentially applying metadata (information about your information) to an object. We practice this all the time: when we write a blog post and want to increase viewership, when we upload an image onto Flickr, or when we identify individuals or places in Facebook posts. 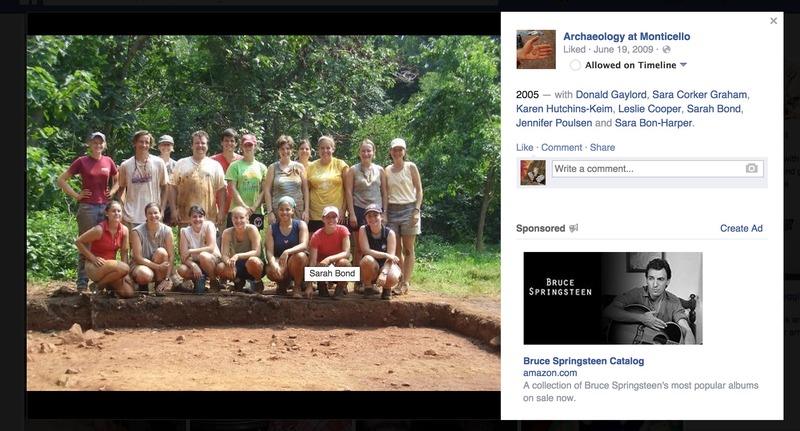 At Facebook’s Desktop Help center, they attempt to explain the reasons for tagging: “When you tag someone, you create a link to their profile…Your status update may also show up on that friend’s Timeline.” In antiquity, tags functioned in a similar manner to today. Though on stone, ceramics, mosaics, and other media rather than the screen, they still broadcast literary and social networks while also providing context for the viewer. In the book Evolution and Ethics (1893), biologist T.H. Huxley wrote that, “One of the unpardonable sins, in the eyes of most people, is for a man to go about unlabeled. The world regards such a person as the police do an unmuzzled dog, not under proper control.” What Huxley meant was that there is a human proclivity toward labeling individuals, objects, places, and concepts. In short? Our minds prefer to organize knowledge. I couldn’t help but recall this quote not long ago, while recording an inscription at the Art Institute of Chicago for the U.S. Epigraphy Project (Fig. 1). 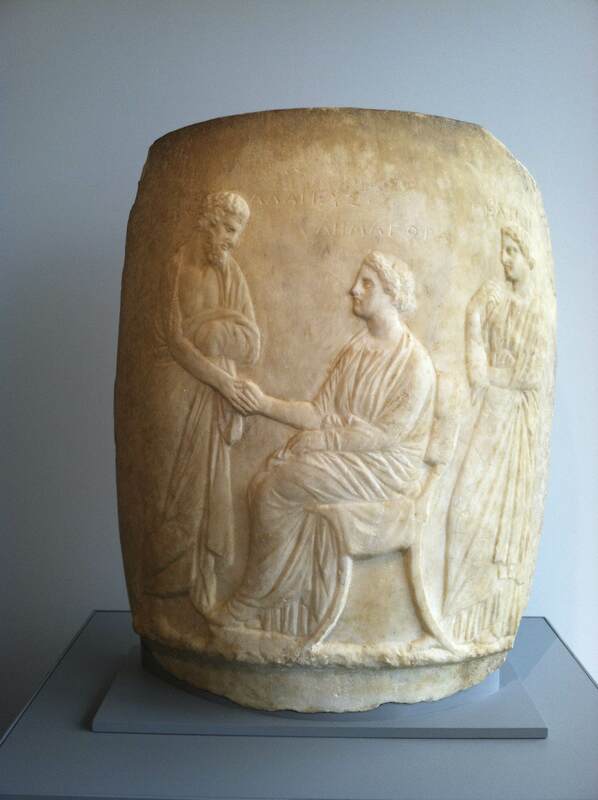 On display in the newly reopened Greek, Roman, and Byzantine galleries of the ArtIC is a funeral monument from the 4th century BCE shaped like a Greek lekythos, an oil jar (Fig. 2). The marble marker didn’t just imitate a ceramic vessel in regard to its shape; it also replicated the tags that often identify figures on Greek pottery. 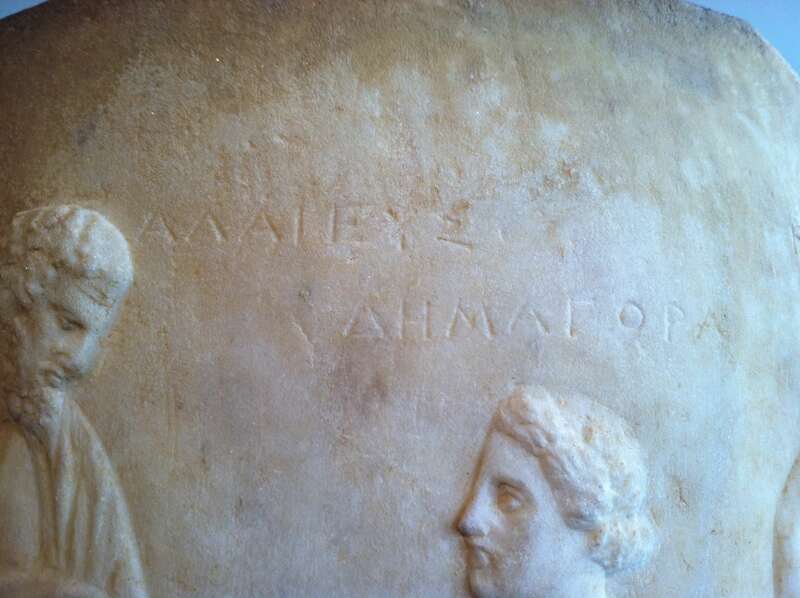 Interestingly, with steady precision, the stonecutter labeled the three figures: Leon Alaieus, Demagora, and Helike (Fig. 3). One of my jobs—along with the other contributors to the USEP—is to visit museums and record the inscriptions on various objects. Many of these epigraphic notations receive little attention from viewers, not only because most visitors can no longer read Latin or Greek (O tempora! ), but also because the modern focus tends to champion the figures rather than the texts. However, we must ask ourselves whether this is a modern bias. By all accounts, there was a strong interplay between texts and images in antiquity that cannot be ignored. Moreover, the inclination toward the organization of information through labeling went beyond simple identification. Much like today, labels functioned in a myriad of ways: to articulate space, to exhibit notions of proper paideia (education) and legitimacy, to trigger collective memory, and to provide deeper engagement with an object. 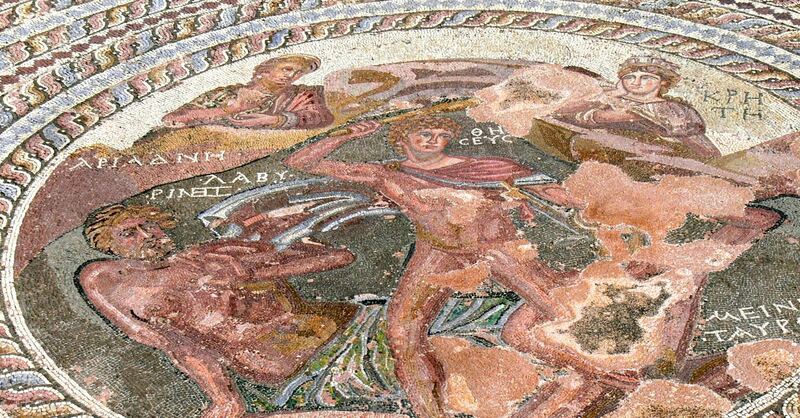 Moving away from classical antiquity and into the late antique period, the interplay between texts and images became more pronounced, particularly through mosaics. 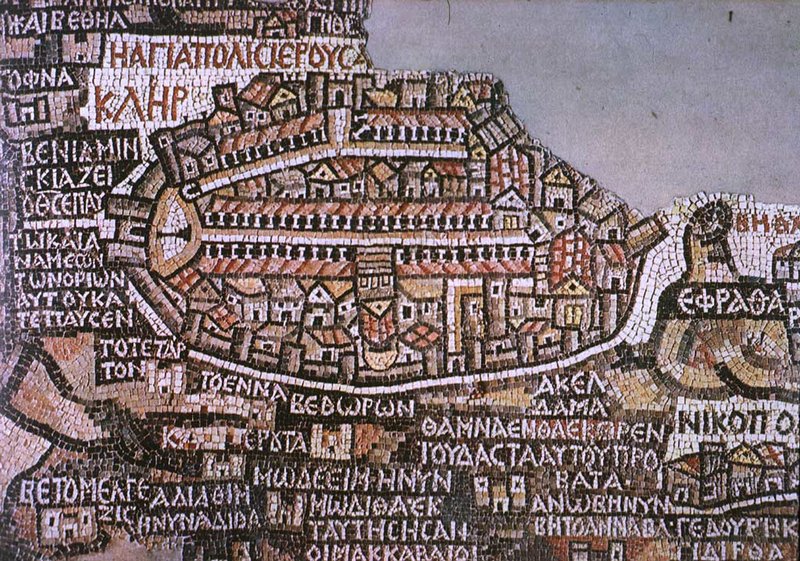 Perhaps the most well known example of this is the Madaba Map, a mid 6th century CE mosaic from Jordan depicting the Holy Land (Fig. 4, interactive version here). Discovered in 1884, the map has a mix of topographical tags and buildings in order to project a worldview of the Christian Near East. The buildings are not to scale, areas are highly distorted, and it would be of little use to a traveller, but then again, the objective of the map is not functionality. To my mind, the incredibly clustered tags are visually advertising the abundance of Christian sites in general. Here the tags and the architecture work together to claim dominion. It is important to remember that just as there are trends in writing materials or in fonts, there were fashions in tagging based on period, place, and medium. During the later Roman empire, it appears to have become vogue in the East in particular to label mosaics. 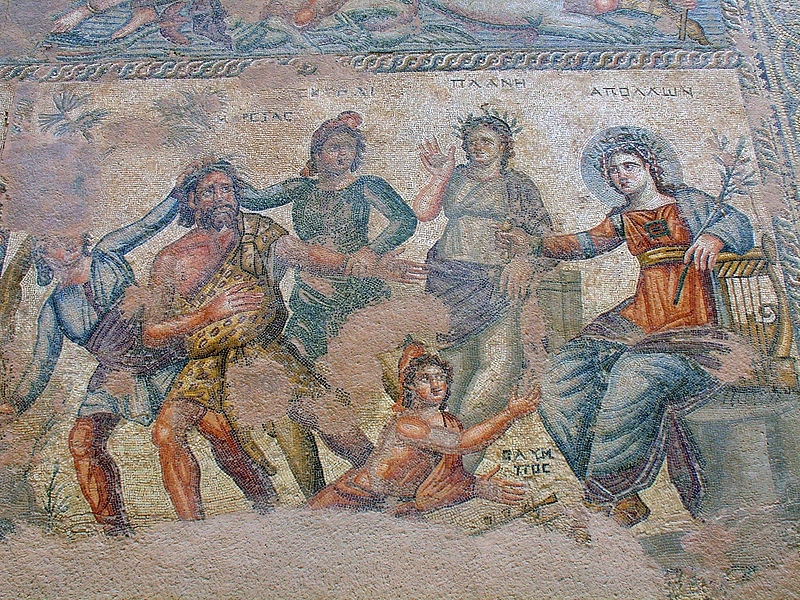 Mosaics from Cyprus, Syria, and modern day Turkey often have labels overtop figures identifying classical figures such as Dionysus or Theseus. Rather than simply assuming these tags were provided due to the ignorance of the viewer in regard to Greek mythology, we should perhaps think about it as a shift in the landscape of writing. 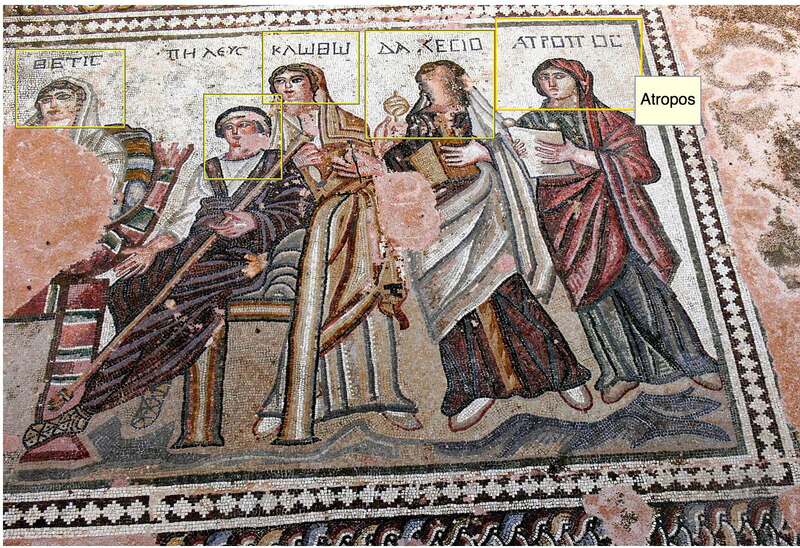 In terms of literacy levels and who could read these captions, labels on mosaics likely required a minimal amount of “recognition vocabulary” (as Greg Woolf calls it) in order to read. They functioned to prompt conversation between dinner guests staring at the floor or perhaps congregants within a basilica, and lured viewers into interaction while perhaps serving to display the education of the patron. What are we to make of this apparent increase in the use of labels on mosaics in the late Roman East? One could perhaps argue that it was the expression of the import of writing and literacy within early Christian communities, but as we can see at Paphos, this trend predated the rise of Christianity. More likely is that labels at various times came into vogue as a means of provoking literary or perhaps geographic discussions that could then be tied spatially (or in later memories) back to the owner of house. As they had previously done in funerary or symposium contexts, mosaic labels also worked in tandem with the space and the image to heighten the viewer’s overall engagement. Just like the Facebook tagging of today, these labels helped the ancient viewer to access and to organize information more thoroughly, often while enhancing the prestige of the tagger. Although the digital tags of today link to databases, both ancient and modern tags similarly function to create a network that individuals are visibly situated within. Wikipedia, for example, allows users to translate tags into their own language (Fig. 7). In antiquity, even if the patron or the deceased was not tagged in a vase or a mosaic, there was an implied association. Just think about your friend who constantly tags people to view New York Times articles or posts Kierkegaard quotes on their walls. What are they really telling you? The walls may have changed, but the coded purposes behind curated images and tagging remain ever the same. Viewers of your posts visit your digital home to view tagged images, even if they have no knowledge of the people within them. Tagging still functions to create networks and to elevate the poster in terms of social capital—the principal coinage in the Facebook marketplace. Earlier this week for our module ‘Text, Culture and Interpretation’, we were looking at the oral/aural and performative aspect of biblical texts. During this session I was explaining some of Jesper Svenbro’s work on the anthropology of reading in Antiquity, particularly in relation to funerary inscriptions. Sarah Bond’s Guest blog is therefore quite timely in provoking more questions about how inscriptions work in Antiquity and, as one of my friends said is also “very cool”! I was just there at the Art Institute three weeks ago and saw that inscription. I also translated part of it for my son before he noticed the placard with the full translation. This was a very nice piece. I wish I had thought to photograph it. Reblogged this on The Rockstar Anthropologist.